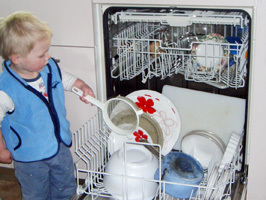 You may not relish doing the cleaning or washing the dishes but young children love to do these things. Getting involved in the life of the home helps them to start to feel part of the family and being part of the family sets them on a path where they start to become aware that they are responsible for their actions. 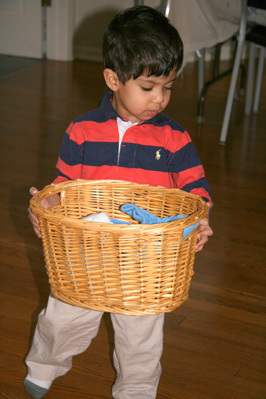 Create an environment with activities that appeal to your child. Your child loves doing the things that you do. This helps her to understand the routines and ways of the life she is becoming a part of. This makes her feel secure and happy and because she is more connected to life she starts to become aware of the consequences of the things that she does. Provide child-sized utensils—brushes, brooms, cloths, bowls, mops etc. Provide a sturdy but light stool that your child can put in places that will give him access to the work surfaces that he would not be able to reach otherwise. You can show your young child how to do many things around the home if you bear a few things in mind. Gradually withdraw your help so that your child finds himself doing it all by himself. Your child will not work in the same way that you do of course. Some things will take her much longer because she is not focussed on getting the job finished as you are. She is more interested in being immersed in the processes. In fact, the end result may be messier than when she began, with soap and water on the floor. The process is far more important to her inner growth than having clean floors. Making time for your child to continue with the things she is interested in doing can be difficult at times but it is essential for her development. We all need time to focus on something, uninterrupted, if we are going to perfect it and this is no different for small children. When young children are allowed to carry out the things they are interested in doing with their hands they gradually gain control over their bodies. Being in control of their bodies helps them to start to be in control of their behaviour too.